SAP sees a "competitive edge" in employees with autism. 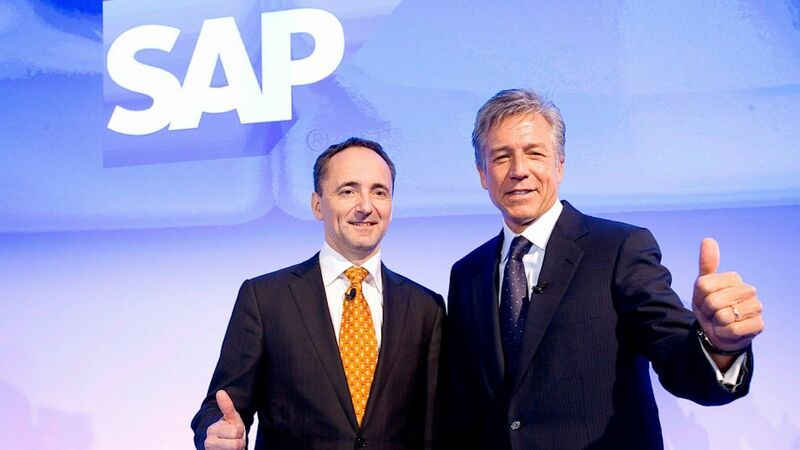 camera (Ulrich Baumgarten/Getty Images) CO-CEOs of SAP AG Bill McDermott, right, and Jim Hagemann Snabe during the annual results press conference on Jan. 23, 2013 in Walldorf, Germany. Autism advocates are praising a German software company for its plan to hire people with autism as software testers, programmers and data quality assurance specialists. SAP, which employs more than 65,000 people worldwide, said it sees a "potential competitive advantage to leveraging the unique talents of people with autism, while also helping them to secure meaningful employment." It will partner with Specialisterne – Danish for "The Specialists" – to recruit people on the autism spectrum. "By concentrating on the abilities that every talent brings to the table, we can redefine the way we manage diverse talents," SAP executive board member Luisa Delgado said in a statement. "With Specialisterne, we share a common belief that innovation comes from the 'edges.' Only by employing people who think differently and spark innovation will SAP be prepared to handle the challenges of the 21st century." Autism affects one in 50 children, according to the U.S. Centers for Disease Control and Prevention. And while many children often qualify for special services, advocacy groups say adults often struggle to find the support they need. "There's a significant need to provide better services and more support for children with autism transitioning into adulthood," said Peter Bell, executive vice president for programs and services at Autism Speaks. "We're thrilled that a major global company such as SAP has made this kind of announcement, which sounds like firm commitment to really address a major need in the autism community." "We're looking forward to seeing how this plays out and whether other companies follow suit," Bell added. For Specialisterne, a company that primarily employs people on the autism spectrum, the SAP partnership is an important first step in changing the perception of autism as a disability in the workforce. "We are very excited by this opportunity to enable SAP global access to a huge pool of untapped talent and therefore, help strengthen SAP's position as a global leader in innovation," Specialisterne founder Thorkil Sonne, who has a son with autism, said in a statement. "The partnership will position SAP as thought leader and motivate the ecosystem to follow its example." The partnership will help overcome one of the biggest obstacles for a person with autism in search of a job: the interview. "Oftentimes it requires what we call 'soft skills,' like the ability to interact and communicate, and those might not be the skills necessary for the job," said Bell. "I think having someone in the middle to help facilitate the process and prequalify people could be very helpful." Anka Wittenberg, SAP's chief diversity and inclusion officer, called the hiring plan a "win-win" for the company and the autistic community, stressing that a diverse workforce boosts innovation among employees. And in her experience, people with autism tend to boost morale, too. "Autistic people don't understand sarcasm and they always speak the truth. Well, really everybody likes that," she said, describing a pilot project conducted last year in Bangalore, India, that served as inspiration for the new hiring plan. "It really helped to improve the climate and culture in the team. The turnover rate went down, employee engagement went up, and we got really positive feedback." SAP plans to roll out their hiring plan in Germany and extend it to North America later this year. They hope to have people with autism make up 1 percent of their workforce by 2020. "We're creating win-win situations, and that's what sustainable," Anka said.